Yep, driving the V6 3.0 litre twin turbo diesel Discovery really gives you the impression there are no hills, mountains or steep roads to tackle while out touring – it’s got that much power on tap. The D4 is a brilliant 4WD to drive on long distance hauls – up, down or flat-as-a-tack-terrain…it tackles it all with ease. 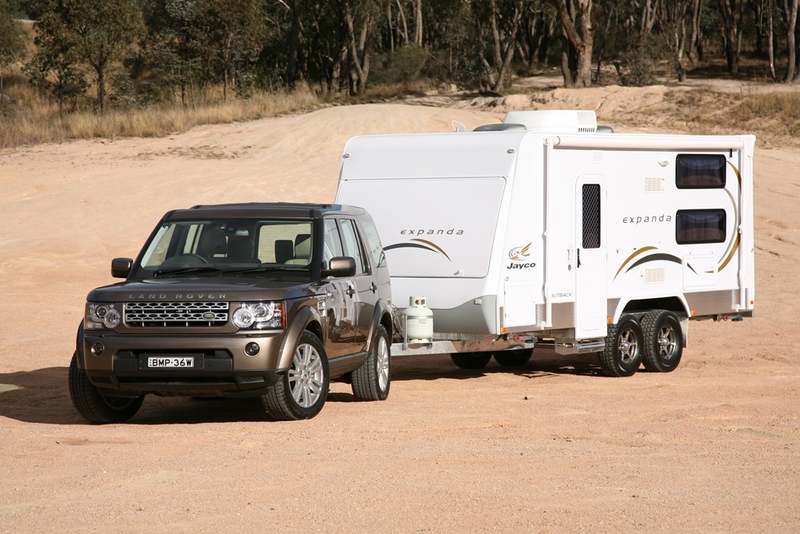 Of course the steeper the grade, the more right boot is needed, but the ability to retain a set speed is impressively easy on both vehicle and driver – which is especially important while towing a heavy van on your ‘round Australia trip or even the weekend getaway. No stress equals increased enjoyment! The new and larger 3.0 litre capacity engine pumps out a huge 180kW and a whooping 600Nm of torque at a low 2000RPM – those numbers (on paper at least) make for an exceptionally good tow vehicle; high torque figures that are available at low revs. Real world driving and towing match the claims and the roll-on acceleration ability is exceptionally impressive – ala overtaking manoeuvres. The six speed auto box (with selectable tiptronic style shifter) also helps with plenty of ratios to choose from. The auto box holds speeds well while driving downhill and also enables a gear to be chosen within a wide rev range, unlike some others that simple won’t slot into a gear until you’re within a narrow speed and rev range. You really couldn’t want for a better combination of engine and gearbox than this D4 3.0 litre variant… well I guess you could, but that’s just being to greedy! With the Jayco in tow and cruising at 110km/h, we clocked just 1850RPM in sixth gear and 2150RPM in fifth. At 100km/h, we returned 1650 RPM in sixth and 2050 RPM in fifth – all good for fuel consumption and right were peak torque comes into play. This tow trip returned an impressive 15.7L/100km which is an excellent result given the size of van we had hitched up and one of the best figures to date for the larger 4WD segment. The D4 has a maximum towing capacity of 3500 kg (with electric brakes), a maximum payload of 657kg and has an excellent amount of usable internal space. Rather than wallow all over the place like a…err… fat lady bolting across an uneven paddock, the D4 returns almost sports car like road handling, while at the same time providing one of the most comfortable and smooth rides your likely to get in a real 4WD. While this test is not about 4WDing, past driving experience proves the D4 is exceptionally good offroad. All these positive attributes with little to complain about makes for a ripper tow vehicle. Seating comfort in the D4 is brilliant and offers a commanding view over the squared off bonnet. Integrated into the steering wheel, the cruise control is easy to operate and does a good job at maintaining the set speed without to much ‘runway’. There is also a host of other steering wheel-integrated controls to allow as much ‘hands on wheel’ time as possible. Rack and pinion steering, in combination with the front and rear height adjustable air suspension provides a superb ‘road feel’ and allows brilliant (for a 4WD) on-road handling characteristics. Our pot-hole dodging strip of road kept the Jayco under control at all times. The D4 always kept it’s composure regardless of whether we were accelerating, braking, dodging those blasted potholes, rounding long uneven sweeping bends or a combination of all the above. The air suspension easily soaks up road irregularities to a point that any other form of 4WD suspension just can’t match. One brilliant use of the air suspension was when first picking the van up from Jayco in Sydney, the jockey wheel wouldn’t lift the van up high enough (due to having been used on the yards tractor prior) to slot the D4 tow ball under. No worries says I to the sales fella; twiddling the centre dash mounted buttons, I drop the D4 down to ‘Access’ height, reverse under the van hitch and pump ‘er up to ‘Off road’ height to slot the tow ball in – nice and easy, no stuffing around with jacks and the like. The complete driving experience from within the D4 is one of quiet relaxed pleasure and all top class. There really isn't too much to complain about and the sheer pulling power would put this Land Rover near the top of the list come time for any big trip involving hauling a van, camper trailer, horse float or anything else that one may wish to tow. The suspension handled the lot with utmost ease and the engine powered on regardless – perhaps Aristotle or Columbus…or was it Magellan… was wrong after all and we really do live on one huge flat plane and not an uneven, mountainous globe! The D4 doesn't seem to take notice of what others falter at and just powers on and on… and on – too much power is never enough! Thanks go to Jayco Sydney for the loan of an Outback Expanda caravan. For more information on Jayco caravans, drop into their Sydney show room at 63-67 Glossop Street St Marys, call (02) 9623 1971 or visit www.jayco.com.au.